I discovered a wonderful room of creativity, and a fascinating story at the Museum of Edinburgh. I took the kids to the fantastic Museum of Edinburgh today, and didn’t want to leave. The story of Edinburgh is told in detail charting the rise of the Old and New Towns through film, recreations and beautiful four hundred year old exhibits. But my true new discovery was the wonderful activity rooms they have for families. On one level a small reading and colouring room over looks the Canongate Kirk. 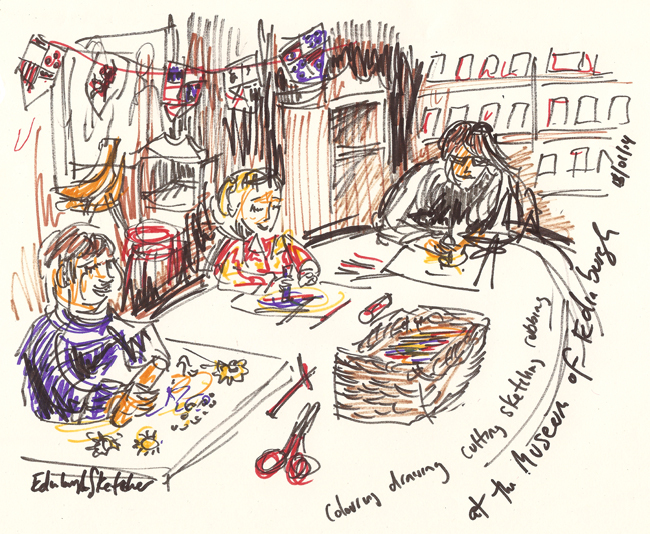 Along the corridor of higgledy piggledy old rooms lies a room full of art materials and activity sheets available. Shelves full of paper of all colours, crayons, pens and pencils surround a large table all ready to be used. We never made it to the dressing up room further along! Amazing, I’ll be there all the time… with or without the kids 🙂 PS If you do use the art materials on offer do make a donation so they can restock.